After a storm, a rainbow often follows--- what rainbows have you had after a stormy time? 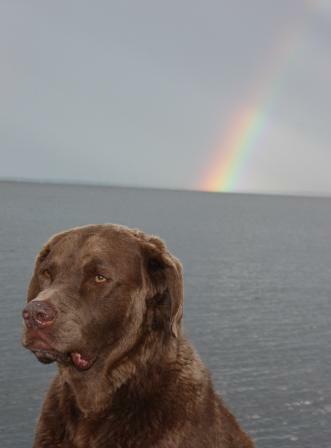 Even in my almost ten years of life, I have had some PAWtastic rainbows at the end of storms. Who knew that my toilet lid breaking episodes, furniture rearranging and thunder storm inspired house damage would result in me being a volunteer, a Pet Therapy Dog? This is definitely one of the rainbows for me, volunteering at the hospital. I meet a lot of people and I’d say many folks focus on the storms and not the rainbows. This week I challenge you to look for the rainbows that follow the stormy times, and if you didn’t have a stormy time this week, perhaps share that perspective with someone who is dealing with their own storms. 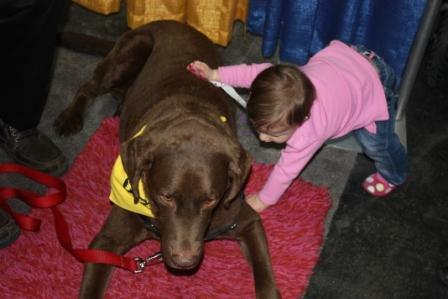 Unit next week, have a PAWsitive Week! 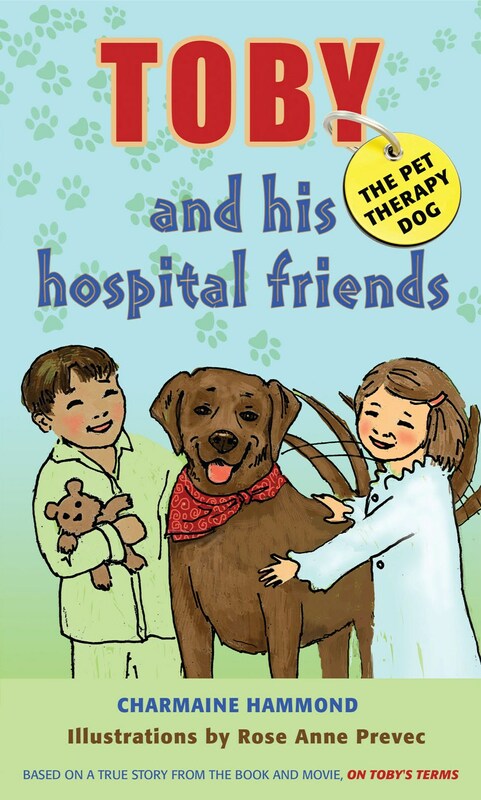 PS Did I mention my new children’s book Toby The Pet Therapy Dog and His Hospital Friends is hot off the press? You can grab your copy by ordering from chris.alcock@hammondgroup.biz if you want a signed copy, or from Amazon or Barnes & Noble websites! 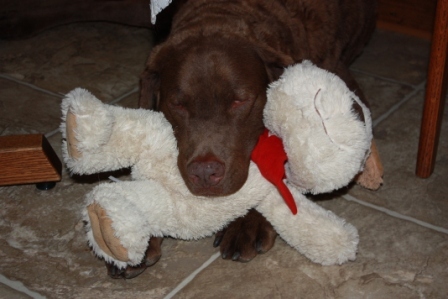 My mind was racing--- playing fetch, making people smile, treats, and cuddling up to a friend or stuffed animal. I am terrified of loud noises- trains, sirens, saws, garbage trucks, firecrackers, and thunder (to name a few). We all have things that we fear, or stretch us out of our comfort zone. When you know what brings you healthy comfort you can reach for it in times that cause fear and discomfort. 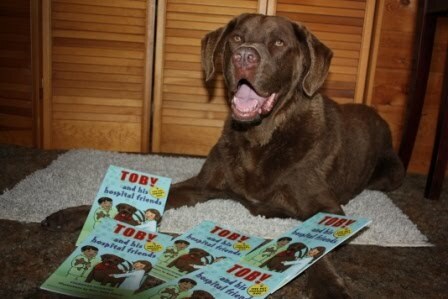 One day I hope to have stuffed Toby’s so that I can deliver them to children in hospitals and group homes everywhere. When we were in California in April for our book tour, Christopher researched where Lassie’s star is located on Hollywood Blvd. It was PAWsome, I got my photo taken with Lassie’s star! Out of the corner of my eye, something caught my attention---- a star without a name--- yet! Charmaine always talks about having a vision, being able to see your dreams in your mind before they even come true. So I took her advice. Christopher took my photo with my star on HollyWOOF Blvd. Now I am one step closer to my dream coming true. Sometimes our dreams are not far out of reach, this star was right beside Lassie’s, within close reach. What are you doing today to reach for your star--- for your dreams? My new book for children, Toby The Pet Therapy Dog- and his hospital friends is here! Woof! Woof! The beautiful illustrations are done by Charmaine’s best friend, Rose Anne Prevec! They have been friends since they were in grade one. This is the first book in a series for children. It is our mission to get these books into children’s hospitals around the world to spread some joy and smiles. In our upcoming blog we’ll tell you how you can get involved in my mission! We hope you will join us. Many Ways to Say You are PAWsome! And to add my own, Toby: You are PAWsome!